After three years of waiting for a bliss QNAP package, two turn up at once! 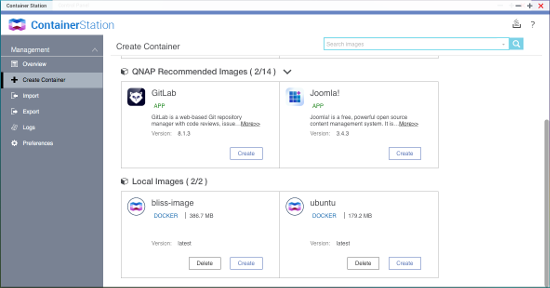 Hot on the heels of Grant Shipley's pre-prepared Docker container, Sean Gordon has written up step-by-step instructions for installing bliss in a Docker container. ... and also the ARM-based TS-x31+ series with a minimum of 1GB RAM. These Docker build instructions are completely generic and should work on any system which supports Docker. Containers are a light-weight virtualisation technology, rather than installing a complete OS image as one does with host virtualisation, containers run on top of the host operating system in an isolated environment created by the Docker Engine. With Docker we need to be familiar with two concepts; images – the pre-configured software image from which we create the container, and the container – the actual execution environment where the program runs. For the bliss install, we’ll first create a Docker image which contains the latest version of bliss and all its dependencies, and then we’ll use this image to create the container which will run bliss on the QNAP. First, connect to the Public share of your QNAP NAS and create a folder called docker, now copy the Dockerfile (download) and bliss-runner.sh (download) files to this directory. 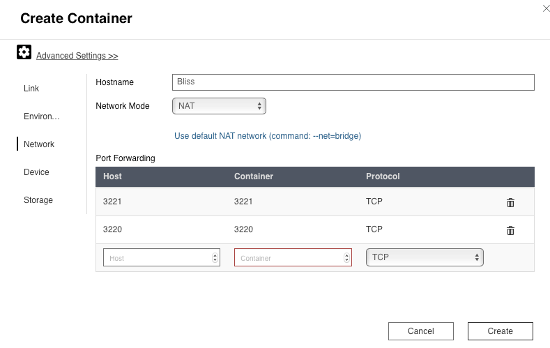 To kick-off the container image build process we need to login to the QNAP NAS - connect to your QNAP NAS using SSH (this needs to be enabled in the QTS Control Panel, under the Network Services section). docker build --rm=true  --tag="bliss-image" . Your numbers will be different as these are unique container IDs which are automatically generated by the installation process. ubuntu – this is the Ubuntu Trusty image which our bliss image is based on. 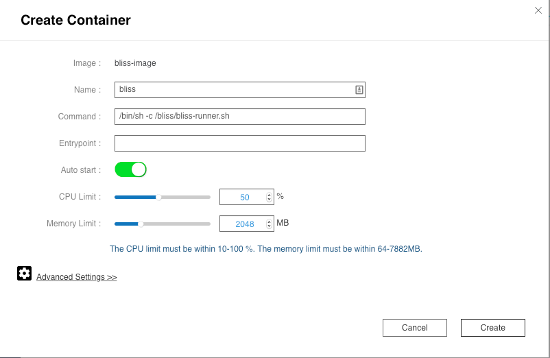 bliss-image – this is the pre-installed image for bliss from which we will build the actual container. So far we have only created the image for the bliss container, next we need to create the actual container which will host the running instance of bliss. Note: Because we are running bliss in a container we need to wrap the standard bliss.sh script in another script which will restart bliss.sh after an update. This is because containers are cleaned up when the process they are running terminates, so if we just started bliss.sh then the container would automatically terminate when bliss exited during the update process. As a result, we need to create a wrapper script called bliss-runnner.sh which will restart bliss.sh if it exits with a zero return code (as happens during an update). If bliss.sh exits with a non-zero return code (indicating an error) then the runner script exits to ensure we don’t get into an endless loop of fail and restart. Now on the Network tab, set the Hostname to "bliss" and set the Port Forwarding to match the 3220 & 3221 ports exposed by the bliss container. On the Storage tab, check that New Volume is set to /config, this is a mount within the container where bliss will store working files and configuration information. Now click the Create button to create the bliss container. bliss will also echo any error messages to this console window – the best way to check bliss is running is to point your browser at http://<your-QNAP-ip>:3220 and configure bliss as normal. Once the container is up and running, bliss is running in the isolated Linux container in much the same way as it would be if you installed it directly on Linux. However, there is one difference when it comes to “logging in” to the container environment if you want to debug or access the command line for the container. And at this point you are logged into the shell within the running container, which will function just like a normal Linux shell. When you are done, simply exit the shell. Thanks Sean! Although this method requires a certain technical know-how to get started, I think the instructions are actually pretty straightforward and familiar to anyone who has set up any kind of virtualisation!